Do you worry about your customer end use? Does it matter to you what your customers do with your products? What job do you want your customers to hire your product for? Let us get some more context here. This quote comes from a 2011 story on the rooster feather fashion trend. People started a new fashion trend of putting rooster feathers as hair extensions. Soon salons all over the country started stocking up on rooster feathers, offering it as fashionable hair trend to their customers. Before this hair craze the only known segment that hired rooster feathers was fly-fishers. Fly-fishers prize Whiting saddles because they have a pliable center shaft and can be wound around fly-fishing lures. “A pattern that creates the illusion of wings fluttering on the end of your line, if you tie it right. Fly-fishers hired the product for a specific job, reasoned with both utilitarian and emotional components. Thanks to their needs and user behavior business for rooster feathers were predictable. Then the surge happened with hairdressers. The hairdressers. They call multiple times a day. They walk in off the street. With hairdressers came different prices. Feather prices saw 500%-1000% price increase as hairdressers were willing to take all the feathers they could because their end customers were willing to pay $50 per extension. With the new segment and its job to be done the same product assumed new value and a new price. Should the fly-fishing shops and rooster farms take advantage of it? Given limited supply and time it takes to produce (the roosters take time to produce feathers) should they embrace the new segment at the expense of current segment? 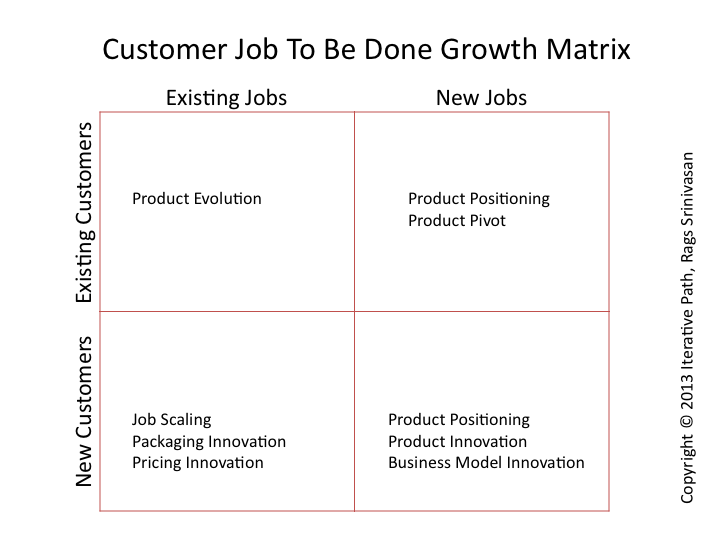 See this scenario in the context of the job-to-be-done growth matrix I created. Fly-fishing shops and rooster feather farms have started in top left quadrant. There was one segment with well defined job to be done and a price to go with it. And without any deliberate action from their part the bottom right quadrant developed – new customers and new jobs. The choice, under constraints, is to whether to move to that quadrant and not serve the current segment. Do we understand the new customers and their new jobs well? Is our product the right candidate for that job, today? Will it remain so tomorrow? What other alternatives do these new customers have for the job to be done? Are my current customers and their job to be done changing? If I choose the new segment, will my current one exist when the new demand dries up? Will our new customers take you in a direction you did not plan on? Will you have competitive advantage when serving new jobs of new customers? So to answer the questions I posed in the beginning of the article, yes you should worry about how your customers use your product. To be precise, what job they are hiring it for. That drives not only product innovation but also your strategic growth decisions. Some see the big upside from new customers and are ready to overlook the uncertainties in demand and the risk it poses to core customers. Others ask the right questions (like the seven questions above) and stick with serving jobs they understand and know they can serve successfully, far into the future. Like this other fly-fish shop owner who is refusing to sell to hairdressers and de-marketing to turn away new customers. There’s no actual evidence, but he’s hoping to start a rumor the feathers cause balding. Reblogged this on The Business of Innovation.